It does blow my mind when I tell people I’m following a fully raw diet and they are absolutely puzzled as to what I possibly eat. Yes I even eat raw “spaghetti and meatballs”! 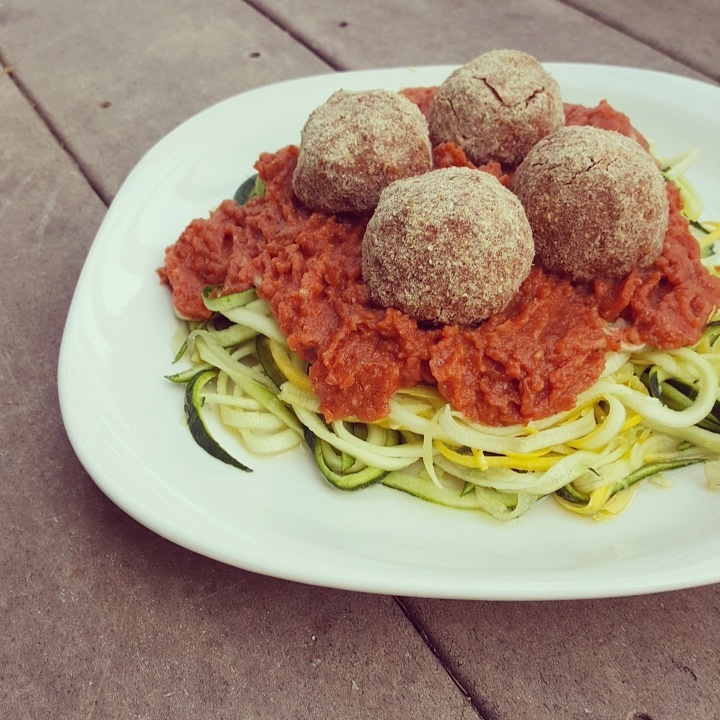 I’ve been working on these raw pizza bites for a while and I will continue to fiddle around with the recipe, but they really brought this meal together. I was so excited for dinner tonight and it was amazing! Blend ingredients and bam instant raw tomato sauce! You can eat these plain or spiralize zucchini. I did a blend of yellow squash and zucchini noodles. What I love about raw food is I can eat dessert any time of day and be totally OK with it because it’s a healthy indulgence. 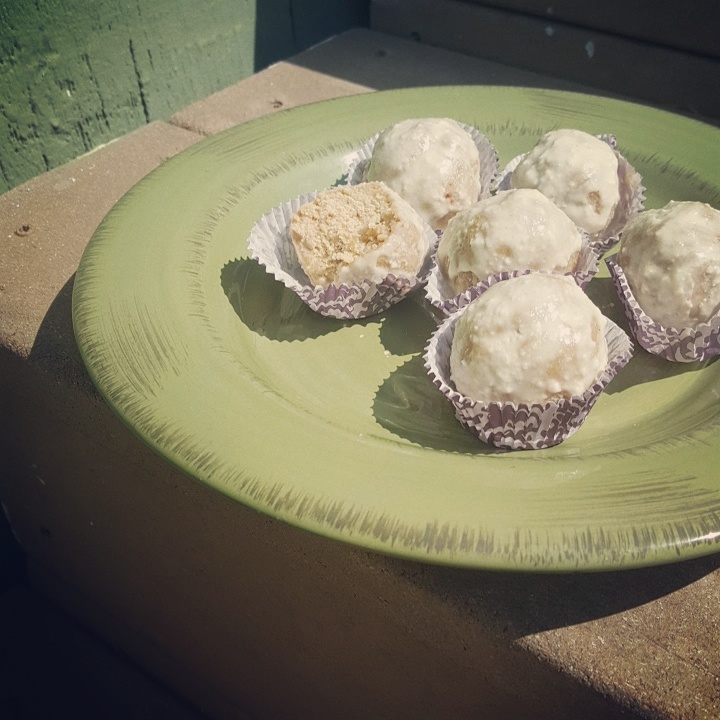 I’ve made raw doughnut wholes in the past when I was fully raw, so I wanted to try again. As with everything I make this was really easy to prepare. The icing was a bit of a task, but I’m happy with how this icing turned out. Little gooey to eat so I kept them in cute cupcake holders. Definitely making these to bring to events to share with others. Seriously when people say they simply don’t have time to eat healthy, I’m all like my food took about 15 minutes to make doesn’t take much time at all. I’ll admit this would be easier to do in a food processor, but I’m waiting on mine to be delivered so I used my vitamix. I’ll be making these again in my food processor to see which way is better so feel free to experiment. Simply blend all the ingredients until they are combined. Then form into balls. No need to refrigerate to set the dough is pretty firm. For the icing what I used will do for now, but for future I’ll be tweaking it. This is where I’ll apologize for not having an exact measurement but I added non dairy milk as it ran to make it an icing consistency. 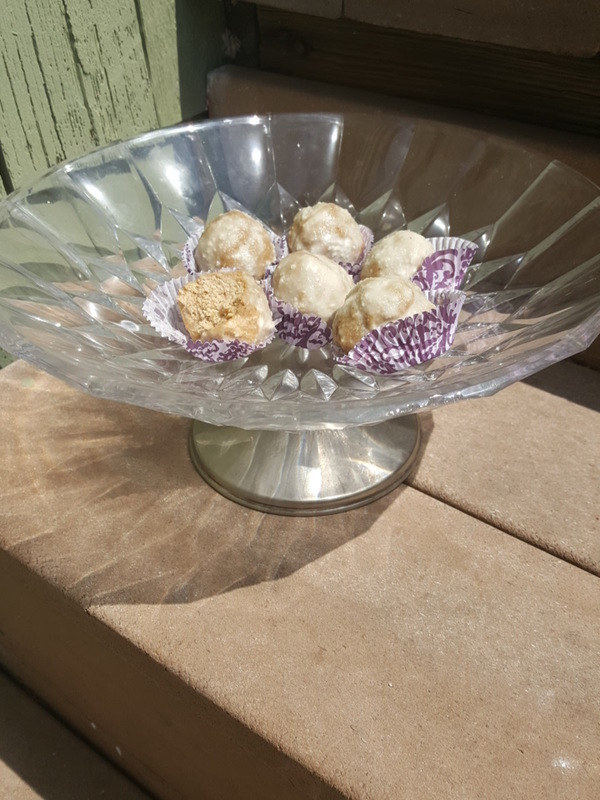 I poured the icing over the truffles and set them in the freezer for 10 minutes. These are quite addicting I ate 3 right after taking the picture. I’m venturing down a fully raw path for a bit, so this blog will have new raw recipes for awhile. I have had recent weight gain from weaning off meds and my thyroid problem is causing difficulty losing it. So I’m changing up my diet to hopefully help me lose the weight. If you’ve never tried overnight oats they are amazing and so simple to prepare. Then in the morning you simply take them out of the fridge and instant breakfast. These are so yummy and healthy. Sugar free, gluten free, and packed with nutrients. 1/2 cup mixed berries I used a few strawberries, blueberries, blackberries, and raspberries. Blend the almond milk with the berries and the dates. Then pour into a glass and combine the oats and Chia seeds. 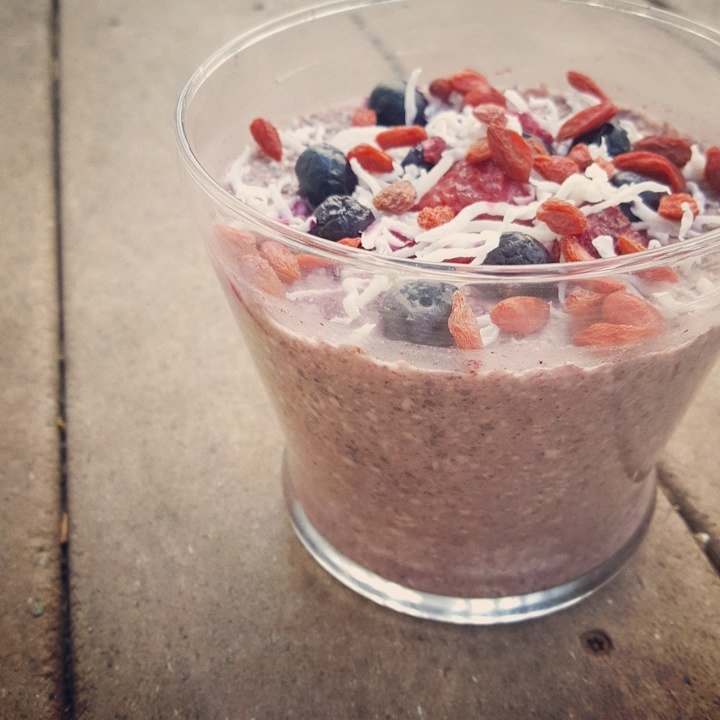 Top with some fresh berries and shredded coconut and goji berries. Refrigerate over night and enjoy for breakfast! 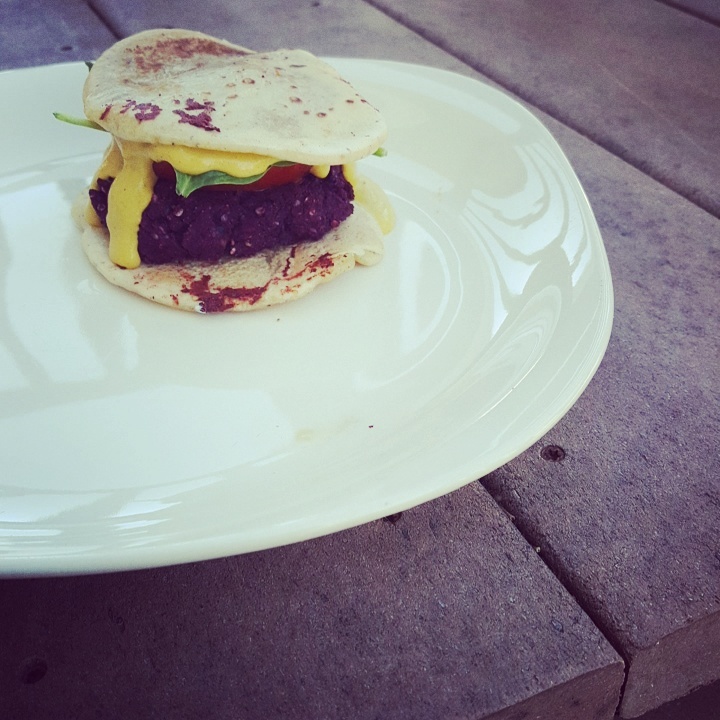 I love veggie burgers and I love creating a homemade one. I really do limit when I eat processed pre made foods. This burger is so easy to make and really good. I’m definitely making these again! Combine all the ingredients in a high speed blender except bread crumbs and flax seed egg. Transfer mixture to a mixing bowl and add in bread crumbs and flax seed egg. Then form into patties and place on a baking sheet. Bake for 20 minutes at 350°. 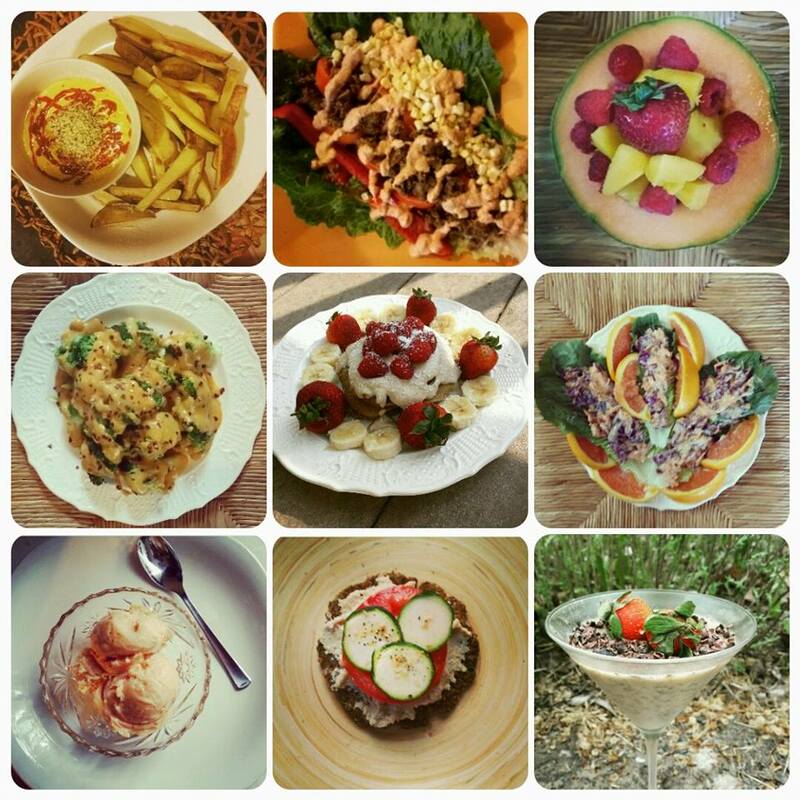 I’m hoping to get back into creating more raw recipes. I loved teaching myself how to prepare raw foods when I followed a fully raw diet for over 3 months. I do enjoy the benefits that raw foods have. I’m dealing with thyroid issues and recently gained weight. So I’m hoping to gain control of this so it doesn’t get worse, so I’ll be eating a higher amount of raw foods. 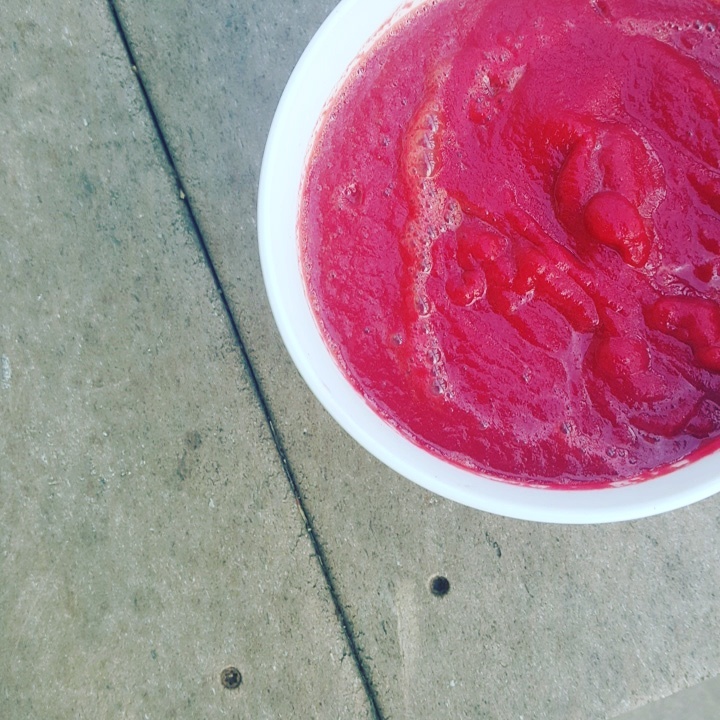 I love beets and wanted to make a raw soup. This soup is super easy and healthy, what more can you want from a meal? Simply add all the ingredients to a high speed blender and add in water to combine and blend until it’s a creamy soup consistency. I’ll admit I want to create a new recipe all the time and even when I’m down to minimal ingredients to work with I tend to be able to whip something yummy up. 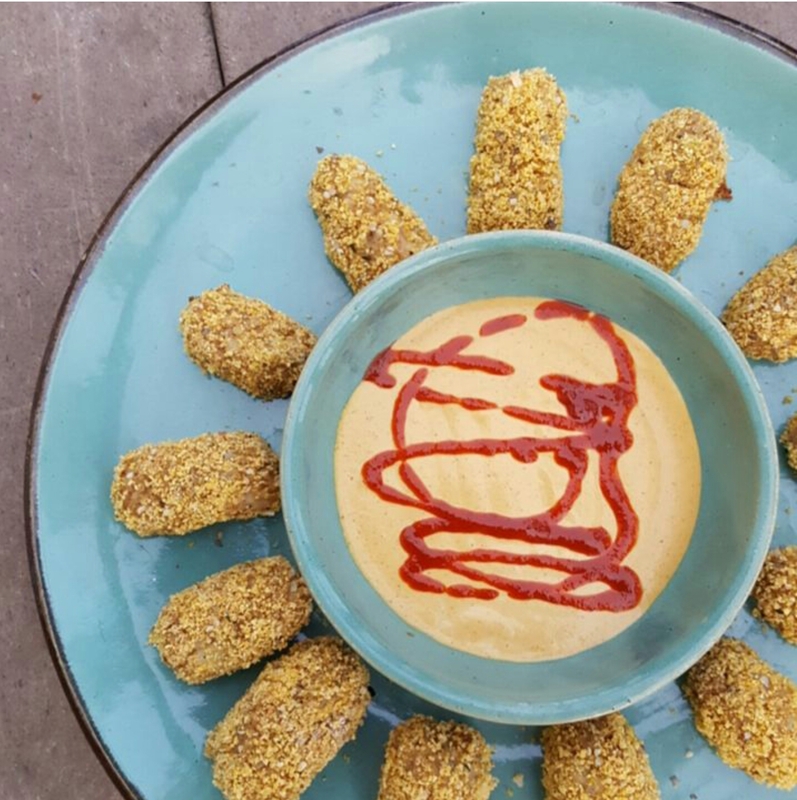 I made these in the past and tweaked them then thought why not bread them and make healthy nuggets. So within a 15 minute food prep viola new creation. Cook the quinoa as per directions on package. Separately cook the cauliflower. Once cauliflower is cooked turn it into mashed cauliflower. Season with onion powder, garlic powder, bouillon soup mix, and seasoning salt adding in non dairy milk to combine. Then stir in the quinoa and add the gluten free oat flour. Next you want to form the mixture into little nugget patties. Then the mixture is sticky enough to just coat in the bread crumbs. Feel free to use regular bread crumbs I prepare all gluten free foods. Freeze the nuggets for 5 minutes. Add the a baking tray and bake for 15 minutes at 350°. To think my whole life if I wanted pasta I would run to the food store and purchase a processed can of tomato sauce. Then from trying out fully raw for 3 months I learned how simple it is to make a fresh tomato sauce. I tend to keep my sauces at a raw temperature and sometimes have a fully raw meal or make pasta to go with it. This sauce is simple and with the help of my vitamix I can prepare it to a raw temperature so it’s slightly warmed. I’ve been sneaking in some avocado seeds for nutritional benefit, but that’s optional. Blend all the ingredients in high speed blender. 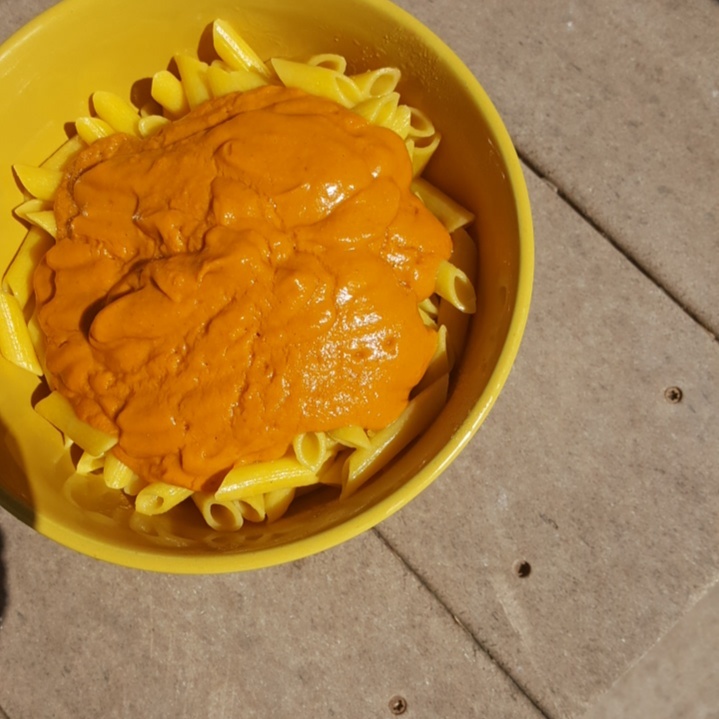 Prepare pasta and top with sauce. Makes 2 servings.